How is created a bar code system in a BOM? 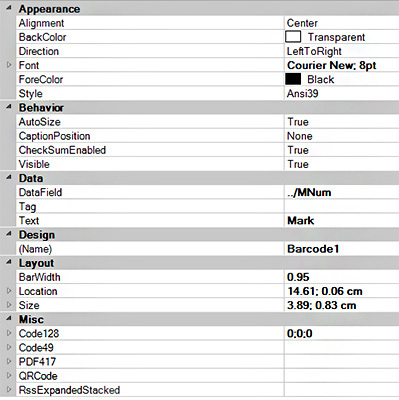 The Autodesk Advance Steel BOM Editor version allows you to define the area for bar code. 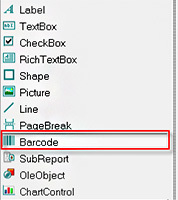 A/ Click in the menu to select the Barcode area definition. 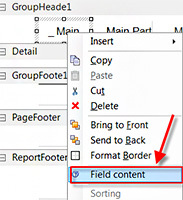 For other data, check with the corresponding data code, with Field Content information and corresponding DataField value. Apart from the barcode style, you can manage the alignment, direction, color, background color, bar width, caption, position, font, text, and check whether checksum is enabled in the Properties Window. Direction Specify the print direction of the barcode symbol. Select from LeftToRight (the default value), RightToLeft, TopToBottom, or BottomToTop. Font Set the font for the caption. Only takes effect if you set the CaptionPosition property to a value other than None. ForeColor Select a color for the barcode and caption. Code 128 Auto uses the complete ASCII character set. Automatically selects between Code 128 A, B and C to give the smallest barcode. Code 128 A uses control characters, numbers, punctuation, and upper case. Code 128 B uses punctuation, numbers, upper case and lower case. Code 128 C uses only numbers. Code128 has three settings that work in conjunction: Dpi, BarAdjust, and ModuleSize. This property only applies to the barcode style EANFNC1. You can improve the readability of the barcode by setting all three properties. • Dpi sets the printer resolution. Specify the resolution of the printer as dots per inch to create an optimized barcode image with the specified Dpi value. • BarAdjust sets the adjustment size by dot units, which affects the size of the module and not the entire barcode. • ModuleSize sets the horizontal size of the barcode module. Code49 is a 2D high-density stacked barcode containing two to eight rows of eight characters each. Each row has a start code and a stop code. Encodes the complete ASCII character set. Code49 Options include Grouping and Group. If Grouping is set to True, any value not expressed by a single barcode is expressed by splitting it into several barcodes, and the Group property may be set to a number between 0 and 8. The default values are False and 0, respectively. When the Group property is set to 2, the grouped barcode's second symbol is created. When invalid group numbers are set, the BarCodeDataException is thrown. Pdf417 is a popular high-density 2-dimensional symbology that encodes up to 1108 bytes of information. This barcode consists of a stacked set of smaller barcodes. Encodes the full ASCII character set. It has ten error correction levels and three data compaction modes: Text, Byte, and Numeric. This symbology can encode up to 1,850 alphanumeric characters or 2,710 numeric characters. PDF417 Options only apply to the barcode style PDF417. 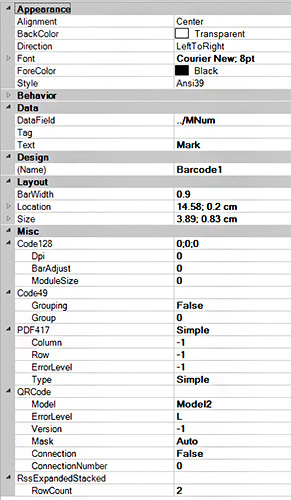 Column sets column numbers for the barcode. Values for this property range from 1 to 30. The default value is -1 which automatically determines row numbers. ErrorLevel sets the error correction level for the barcode. Values range between 0 and 8. The error correction capability increases as the value increases. With each increase in the ErrorLevel value, the size of the barcode increases. The default value is -1 for automatic configuration. Row sets row numbers for the barcode. Values range between 3 and 90. The default value is -1 which automatically determine row numbers. Type sets the barcode type to Normal or Simple. Simple is the compact type in which the right indicator is neither displayed nor printed. QRCode is a 2D symbology that is capable of handling numeric, alphanumeric and byte data as well as Japanese kanji and kana characters. This symbology can encode up to 7,366 characters. QRCode Options only apply to the barcode style QRCode. Connection allows any value which cannot be expressed by a single barcode to split into several barcodes. This property is used in conjunction with the ConnectionNumber property. ConnectionNumber Use this property with the Connection property to set the number of barcodes it can split into. Values between 0 and 15 are valid. An invalid number raises the BarCodeData Exception. RSSExpandedStacked uses the EAN.UCC information with AI elements as in the RSSExpanded, but stacked in two rows for a smaller width. RSSExpandedStacked allows you to insert an FNC1 character as a field separator for variable length Application Identifiers (AIs).